Pregnancy can be miraculous but overwhelming. Women are used to living their lives in a certain way when suddenly, they question everything we do. Unfortunately, fitness is often the first to go when getting pregnant, which is a big mistake. Fitness, good nutrition and overall health are important for every woman at each stage of life, but never more important than when a woman is pregnant. Maintaining fitness during pregnancy helps both the mother and the child during the pregnancy and can make the mother’s recovery much faster after birth as well. Pregnancy puts incredible demands on a woman’s body and can often cause fatigue, excess weight gain, foot, knee, back pain, and depression. Working out helps to alleviate and even prevent some of those issues, builds and strengthens muscle for delivery and recovery, and helps a woman to get her pre-pregnancy body back much sooner. Now that you're pregnant you're scared to start or keep exercising. Most women know that exercise during pregnancy is safe. Yet when it comes to the particulars -- Is it OK to work my abs? Can I still lift weights? Should I quit running? Should my heart rate be low? How often? How much should you do? How intense? -- myths and misconceptions still persist, which prevent an all-belly pregnancy and hold women back. Being Inactive Is The Real Risk! The benefits of prenatal exercise are undisputed - for both mom and baby. In fact, many experts say that being inactive is the real risk leading to high blood pressure, excessive aches and pains, and a high risk for gestational diabetes. It will also give you a healthy buzz helping you feel better physically and emotionally, and the calories burned can help prevent the outrageous weight gain. Our exercise regime will also help you cope during the postpartum period (another stressful period!) and keep the “baby blues” at bay. All good stuff to get excited over! There are some guidelines, though, to ensure that your workout program is safe for both you and your baby. 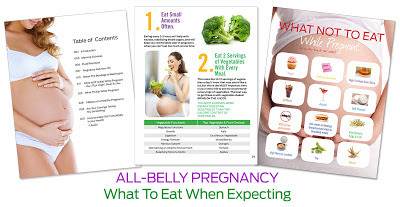 Most women are able to work out during pregnancy without any problems; however, some conditions and issues may mean that you will have limitations. Problems such as hypertension, gestational diabetes and prior early labors may mean that your activities should be somewhat limited. Bear in mind that many OB-GYNs are hesitant to give the go-ahead on exercise during pregnancy because of the lawsuit potential if something goes wrong. If your doctor seems unwilling to okay an exercise program, ask if he has specific concerns and what they are. Hydration before, during and after a workout is important for everyone. But during pregnancy, women tend to have lower blood pressure due to the large volume of blood being directed to the womb. Dehydration, even in the mildest stage, can make this problem worse and even be dangerous. Start your workout well-hydrated, sip water throughout your exercise session and be sure to rehydrate afterwards. It’s extremely important that a pregnant woman’s body temperature not get too high. Hormonal and immune system changes mean a slightly elevated body temperature during pregnancy. It can be easier to get dangerously overheated while working out. Be sure to wear light layers during exercise, try to work out in a cool or shaded environment, and take a break if you begin to feel hot, faint, weak or dizzy. You’ll also want to monitor your heart rate carefully. Because of low blood pressure, an elevated heart rate can cause dizziness, fainting and even more serious problems. Most studies done on this topic suggest that a max heart rate of 140bpm should be safe, but consult with your doctor. Kegel exercises strengthen the pelvic floor, helping you to avoid incontinence and other issues during and after pregnancy. The great thing about Kegels is that they can be done several times a day, no matter where you are. No one will even know and you’ll be glad later that you did. There’s absolutely nothing wrong with looking amazing while you are working out, even when you’re pregnant. But pregnancy is not the time to wear overly restrictive clothing, especially things that are tight around the waist, calves and ankles. It’s also important to make sure your shoes are the right type for your workouts and in good shape. You may also need to buy one size larger than you normally wear to prevent or accommodate swelling. You will have plenty of time to pick up where you left off in horseback riding, roller derby or high-intensity interval training. For now, these things are off limits. The risk of falling or being hurt by some sort of impact is enough of an issue but your balance will be off during most of your pregnancy as well so it’s just not safe. It’s simply not worth the risk. No matter how concerned you are about getting fit or avoiding an unhealthy weight gain, your first concern needs to be your safety and the safety of your beautiful baby. You can try something new (and more likely to trip you up) after the baby is born. “No pain, no gain” does not apply to pregnant women! If what you’re doing is causing pain, stop it immediately. The same applies if you feel dizzy or faint and most certainly if you notice any bleeding. Not only are you carrying extra weight, but your body is distributing that weight in a way that you’re not used to. This can affect your balance, making balance exercise unadvisable. You also have plenty of extra pressure on your back without adding to it. Again, this is largely because of your new (and often lacking) sense of balance. It’s also not a good idea because of low-blood pressure during pregnancy and changes in the hormones which help lubricate your joints. Not only is this an issue of balance, but lifting heavy weights also increases intra-abdominal pressure. Excess intra-abdominal pressure can be a serious matter causing muscle injury or even early labor or bleeding. Working out throughout your pregnancy will help keep up your energy level, prevent unhealthy weight gain, and avoid a whole laundry list of pregnancy’s possible side effects. Being fit will also help you to be in top shape for birth and get back into bikini shape afterwards. Just be sure you do it safely and it will be an important part of enjoying both your pregnancy and your new baby! 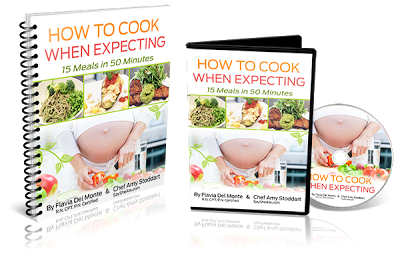 Bonus for anyone who orders a copy of All-Belly Pregnancy this week - "How To Cook 15 Meals in 50 Minutes".